Why should I share ? Edward is almost forty and works in an international company. He is a CIO respected by his peers and made himself a good reputation on the web on different topics including Knowledge Management. One day, he was invited to a meeting with the heads of departments to discuss a topic which at first seemed trivial: access security on PowerPoint presentations. It was clear for him that this kind of presentations should be available to a maximum of people since they contain nice and reusable information for sales people. Instead of that he was surprised to attend a departmental war between the technical department and the sales department. The technical department was accusing the sales department to reuse information in their PowerPoint without understanding the technical consequences. The tension in the room was high when a corporate member came into the room, excusing himself for being late. What happened next was unreal, the battle recently engaged between the departments deviated and people which were fighting against each other 5 min before now joined their force against the corporate side accusing it to be responsible for sharing information with other entities. The battle was harsh and with no pity for corporate and despite Edward’s attempts to calm people down, no decision could be made. He knew at this point, that he was losing his time again in an endless meeting where conclusions were actually drawn far before the start: the heads of departments only would have access to the so “precious” presentations. He tried a couple of times to argue that exchanging know-how between internationally spread entities was fundamental for the survival of the organization but no one was ready to give in and the decision was postponed (as usual) until the next meeting. Unfortunately, there was no another meeting and a few months later, the recession came to an end and the company forgot where the real enemies were standing. The competitors were suddenly well organized and could foresee every move the Edward’s company was trying to make. They had apparently organized their information network, understood the power of international collaboration and seemed to innovate in areas where the company of Edward would have never expected to see them. Edward saw his company abruptly drawn with his “so protected” know-how like the Incas disappeared with their secrets in the past. Even if this story is fictional and any resemblance to persons living or dead is purely coincidental, we all know a company similar to the one Edward is working for. What went wrong? Could we have helped Edward saving his company from bankruptcy? Technologies: a catalyst for Knowledge sharing? Many organizations have introduced intranets and knowledge repositories in an attempt to harness the knowledge of its employees and some still believe that technologies alone will enhance knowledge sharing. This knowledge sharing is essential for the constant innovation lifecycle of a company and I suggest listing some factors that can promote or not tacit knowledge sharing. This Knowledge is highly personal, hard to formalize and therefore difficult to communicate to others (Nonaka, 1991). It refers to internalized skills, mental models and perspectives based on experience. 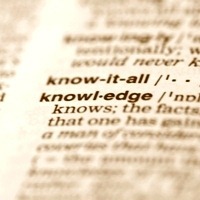 There are 2 aspects in tacit knowledge: the technical and the cognitive aspect. The first one is based more on how to do things when the second explains how to think. Sharing both aspect of this knowledge involves helping someone and therefore the knowledge donor will have to spend time which is a scarce resource in most people’s workdays. Outside the wall of an organization, humans tend to share knowledge naturally. I remember of my neighbor’s father came to see me as I was standing in front of my house preparing wood to make a staircase in my house. He is a retired carpenter and gave me advices on how to build it properly. Even though I was not asking for help, he passed by every day and gave me his advices and knowledge in this particular area. I could feel that in a certain way he did the stairs and that’s maybe one of the reasons of his pure altruistic gesture. Anyway, we have both something in common: we like to help others and share what we know but this kind of behavior seems rare inside an enterprise. Why is it so different inside an organization? There are different factors why knowledge sharing inside an organization differs from an organizational citizenship behavior (OCB). Inside an organization, the knowledge acquired by the employees is part of their assets. They have sometimes personally invested time and effort in order to acquire it and therefore, they have to be sure that they will get the credit for their knowledge sharing. They want to be recognized as the sources of the given information and the fact that someone may use this knowledge to promote himself or herself without giving the credit has disastrous consequences on this knowledge sharing process. Especially since the knowledge sharing behavior is not easily observable by superiors and management does not often identify who shares what. Such behavior is unacceptable but I am sure that some of you once made the experience in your organization and this may explain why PDF are so popular when it comes to exchanging documents between individuals. A kung Fu master will give his knowledge sparingly to some selected disciples. Trusting them to use this art in the desired way and spreading it throughout the time by selecting new disciples. In addition to certain recognition that they may be recognized as the source of the knowledge sharing behavior, getting the confidence that their knowledge will be treated with respect and that the recipient has enough experience to make use of it are two primary factors in the knowledge sharing process. Without this trust, any initiative even supported by management will fail. We have to focus on the pivotable role of people in this dynamic of Knowledge sharing and management must show the example. Trust is supposed to flow downwards in the organization. Trust and relationship are deeply connected so that we could easily say that the key is the connections between the employees. Once again, face to face contact in an informal atmosphere such as coffee rooms or smoking areas is critical for good social interactions among employees. In those informal atmospheres, people tend to ask questions or requests they would never do in another environment. This is maybe one of the reasons why many innovative firms in Japan have created “talk rooms” which are lounges where tea is served all day long and people from different departments can discuss together on different projects. Those areas enhance connections and innovation at a low cost.